Cottage near Bristol - Beautifully presented with rural views. A tastefully restored cottage apartment attached to the owner's property, but with its own entrance, garden patio and car parking, in the hamlet of Dundry in Somerset, 6 miles from the city of Bristol and Bristol Airport. This gorgeous hilltop Dundry cottage apartment enjoys rural views, an ideal backdrop for relaxing after a day exploring the area. This attractive, beautifully-presented, modern Dundry cottage apartment provides spacious accommodation, including an open plan living and dining area with well-equipped fitted kitchen, and patio doors leading to a pretty garden, ideal for alfresco dining. Free-range eggs from the owner’s chickens are usually provided. This Dundry cottage apartment is just a few minutes' drive from an award-winning Michelin star-rated village pub and eating house. Walkers, cyclists, fishermen and landscape lovers are ideally placed in this Dundry cottage apartment for exploring the Mendip Hills, renowned Cheddar Gorge and caves, and Chew Valley Lake, an SSSI and national bird watching centre. Further afield the Georgian city of Bath, with a wealth of character and visitor attractions, and the exciting harbour city of Bristol both provide plenty to see and do. A perfect Dundry cottage apartment base in rural Somerset. There is a twin bedroom with adjoining toilet and shower room and a double bedroom with en-suite bathroom. Free access to wi-fi is available. Chris and Cynthia bought the property 8 years ago and converted what was then an 'annexe' into holiday accommodation and have been running 'Oolitic Springs' for 5 years. We loved the rural location but also the close proximity and easy access to Bristol city centre and we thought that others would like it too. We are both environmental professionals who work in Bristol. Cynthia is an Environmental Consultant and Chris is a Hydrogeologist, which may explain the hydrogeological theme to the property's name, which originates from the springs which emanate from the Oolitic Limestone which crops out just below the ridge of Dundry Hill and can be seen from the surrounding footpaths. In our spare time Cynthia collects carnivorous plants which can be seen in the greenhouse in the garden and Chris is an avid runner who regularly competes in the Bristol Half Marathon. The property is modern, spacious, clean, comfortable, well decorated and furnished and suitably equipped for a comfortable self catering holiday. However most people chose Oolitic Springs for its unique location. Situated in a rural area surrounded by fields yet less than 6 miles from, and with easy access to Bristol city centre. It is also conveniently located for the Roman town of Bath and the spectacular natural landscape of the Mendip Hills which include Cheddar Gorge and Wookey Hole. The property also has good access to both the M4 and M5 which make trips to locations further afield, such as the south-west of England and Wales, the midlands and the south-east possible in a day. We believe that Oolitic Springs' rural setting but close proximity and easy access to Bristol make it quite unique. Sitting on the decked area, you feel like you're in a different world, to the 'hustle and bustle' of Bristol and it is hard to believe you are less than 6 miles from the city centre. toilet, tub, Shower attachment in bath. En-suite bathroom with bath, basin and WC to double bedroom and en-suite shower room with double shower, basin and WC to twin room. Linen provided and changed weekly. Spacious open plan living room with sitting area. Refrigerator with small freezer compartment. Well equipped with dishes and utensils suitable for a self catering holiday. Well fitted kitchen with electric oven and hob, microwave, fridge with freezer compartment. The dining area contains a table to comfortably sit 4 people. A library of books is provided. A small raised decking area outside of the front door with a picnic table and seating for four people. Woodsprings Golf & Country Club is located 3.5 miles away. It has 27 holes of championship golf, a 3-tier luxurious clubhouse, short game areas and a 25 bay floodlit driving range. Notes on accommodation: Sorry, no pets and no smoking. Note: This property does not accept children of 9 years and under. Outside: Off road parking for 2 cars. Private patio and a pretty garden, ideal for al fresco dining. Utility Room: Ironing board and iron. Cleaning / Towels / Linen / Maid service: Towels and linen are included. The property is cleaned weekly and towels and linen are changed weekly. Comfortable cottage close to Bristol. Well set out cottage for family with grown up children. All as described. Thanks very much Mark. We'd love to have you stay again. Best wishes Chris and Cyn. Clean and tidy in a perfect location for visiting local attractions. Fantastic hosts. We couldn’t have asked for a better location, helpful hosts or such perfect accommodation. 15 minutes from the city and yet on the edge of the countryside. Chris and Cynthia couldn’t do enough for us, especially when we were dealing with a poorly little girl for an extended period! The place was perfect for a family of four and couldn’t fault how clean and tidy it was. We will definitely return!! Thanks James. You were great guests. We'd love you to stay again. Best wishes Chris and Cyn. A tasteful, comfortable annex apartment in the country yet a stones throw from Bristol City. 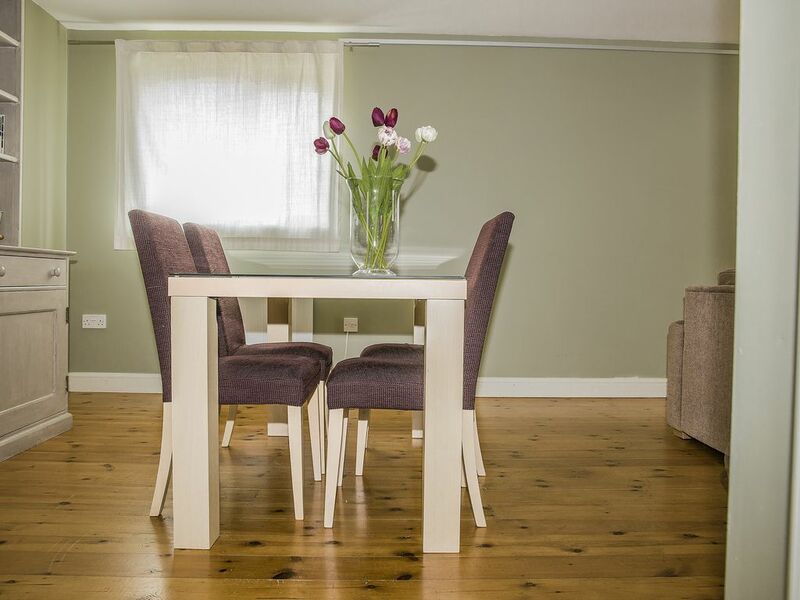 The cottage apartment is tastefully & comfortably furnished. There is everything you need for a happy break. I was welcomed warmly and felt reassured to have Chris and Cyn next door although they were entirely respectful of my space. Parking is easy and there are wonderful walks from the doorstep. I stayed here for a few days while my house in Bristol was undergoing major refurbishment. It would be a fantastic place fir visitors to Bristol as coming in and out of the city is easy. Hi Jane. Thank you for your kind comments. It was a pleasure having you stay at Oolitic Springs. I hope your renovation work is now complete! Lovely cottage, ideally positioned for visiting Bristol, Bath and all the local sights. Lovely cottage. Comfy beds. 2 good bathrooms, although shower in main bathroom would be good. Good kitchen. Friendly owners!! Very friendly welcome to this nice sized property in a great location. Easy drive to Bristol, Bath, Cheddar Gorge etc... with a handy co-op only 5 mins drive down the road. If your lucky you may even get some eggs from the chickens. Would use again, recommended. Thank you for your kind words. I'm glad you enjoyed your stay. It was lovely having you. Please feel free to return any time. Lovely property. Amazing location. Superb owners. Friendly cats and chickens. Could not have asked for anything more. Hi Karen - Thank you for your kind review. I'm really glad you enjoyed your stay. I'd love to see you again. Best wishes Chris and Cyn. Less than 6 miles from Bristol Airport and Bristol city centre and approximately 15 miles from Bath. The hamlet of Dundry in Somerset overlooks both Bristol City to the north and the Chew Valley Lakes/Mendips to the south. The city of Bristol is world renowned as a port & has a wide range of museums highlighting the city's history including Brunel's SS Great Britain. Slightly further afield is the Roman city of Bath which is a World Heritage City and is home to the fabulous Roman Baths a range of museums and the Botanical Gardens. A wonderful location to visit at any time of the year. The cottage apartment is situated on the top of Dundry Hill, an East West trending ridge of Oolitic Limestone. The underlying Mudstone results in a spring line on the slopes of the hill, giving the apartment its name. The hamlet of Dundry enjoys a rural position, overlooking the southern fringes of Bristol to the north and the Chew Valley Lakes/Mendips to the south. Dundry has two pubs with restaurants, and is ideally placed for enjoying all the countryside walks, cycle trails and scenery of this lovely area. The city of Bristol is world renowned as a port and has a wide range of museums highlighting the city's history. Step on board the world's first great ocean liner, Brunel's SS Great Britain, in Bristol's historic Harbourside or visit Bristol Museum & Art Gallery which features outstanding collections of art, archaeology and natural history. The tranquil village of Chew Magna and the Chew Valley lakes, a SSSI and national birdwatching centre are a stones throw away. Chew Valley is famous around the world for its scenic beauty and top quality trout fishing. For further details of fishing the Chew Valley lakes. Good food is available at The Pelican Inn and The Bear and Swan in Chew Magna, whilst The Carpenters Tavern, a traditional Country Pub serving local ales and food, is located within easy walking distance of the cottage apartment. The local area is ideal for Mountain biking especially with the introduction of two new trails in nearby Ashton Court Estate and Leigh Wood. The new trail network has been designed by Phil Saxena – who also designed the cross-country track for the 2008 Beijing Olympic Games. Changeover Days: Three-night rentals can commence any day between Saturday to Wednesday each week. Change over day for seven-night rentals is Saturday only. Our guests may enter the property after 3.00pm on the arrival day and must leave before 10.00 a.m. on departure day.